Dare to Soar Eagle framed desktop print image: With wings spread wide and eyes set on the open skies, a bald eagle soars confidently above the fog-covered hills below. 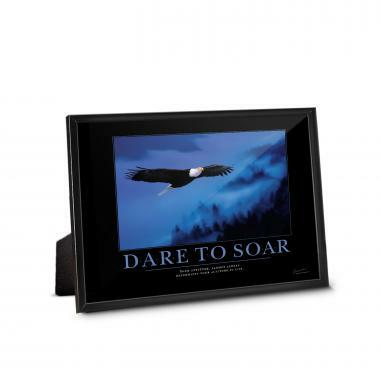 Jump-start each day with a 5"x7" Dare to Soar Eagle framed desktop print in every work area. This easel-backed framed desktop print has a matching motivational poster.